iPhone apps are quickly going mainstream. 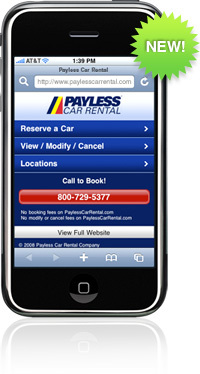 We recently launched a slimmed-down version of the Payless website for iPhone and iPod Touch users. Simply point your iPhone or iPod Touch to PaylessCarRental.com (or PaylessCar.com). The iPhone and iPod Touch optimized website also features a “Call to Book” button that, when pressed, will quickly connect you to a reservation agent who will gladly assist you in the booking process. For your convenience, we have included links to our Store Locations, where you can view a store location’s map and contact information while on the go! While I probably won’t plan my trip around what’s compatible with my iPhone, it’s another sign that companies see catering to iPhone and iPod touch users as an important opportunity.